Leila MacGillivray and Nicola Gemmell excited to meet Fairy Queen (Dorothy Simpson) in her ice palace. Oban’s successful 10-day winter festival came to a noisy finale last night with a firework’s display and musical parade. The pyrotechnics were set-off from McCaig’s Tower with a crisp and clear night providing excellent viewing conditions. A parade led by Oban High School Pipe Band arrived at Oban Distillery prior to the show. This year’s them was “The Big Racket” and participants were invited to bring along an instrument to play. Live music, ceilidh dancing, stilt walkers, a magician, balloon art and hot food and drink were laid on to entertain the crowds. The steadily-growing festival also offered a variety of attractions around the town during the day, from Victorian markets to late-night guided walks, art exhibitions, whisky, gin, wine and chocolate tastings and a funfair. There was even a snowboard simulator in the town centre. Earlier, 14 Scottish butchers went head-to-head in the cask room of the town’s distillery to compete for the coveted Golden Haggis Award. Members of the public had the chance to taste the haggis and cast a vote in the People’s Choice Award. Both competitions were won by Mearns T McCaskie Butchers from Wemyss Bay. In keeping with the Scottish theme, the annual St Andrew’s Pipe Band Ceilidh took place in the Argyllshire Gathering Halls on Saturday night. A tartan dash fun run and haggis hurling competition were held at Ganavan during the day. And popular new edition to this year’s festival was the Winter in the Woods event at Glencruitten. 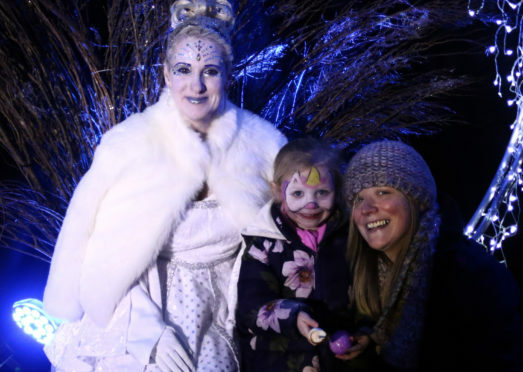 Visitors were taken to the beautifully lit woods and walled garden in a nighttime walking event with stories, performances, a light show and challenges and even an igloo. Pamela Lockhart, chairwoman of Oban Winter Festival, said: “The highlight has been the Winter in the Woods display. There was a fantastic response from everyone who went, with everyone thanking the volunteers and asking for it to be brought back next year. “We have been really busy. All of the stallholders were happy, while some even ran out of stock during the festival’s first weekend. “The late night shopping events went well. More shops stayed open this year and the shopkeepers were happy with the results. The festival opened last weekend with the switching-on of the Christmas lights and a reindeer parade. Next weekend will see some extra events laid on to celebrate St Andrew’s Day, when Saltires will be beamed on McCaig’s Tower. There will be a ceilidh in The View on Friday night with performances from Oban High School Traditional School of Music. Saturday will see a St Andrew’s Fair taking place in the Perle Hotel where Rockfield Gaelic Choir will perform. There will also be a Young Entrepreneur Market at Oban Distillery, when the young business people of the town will showcase their talents.